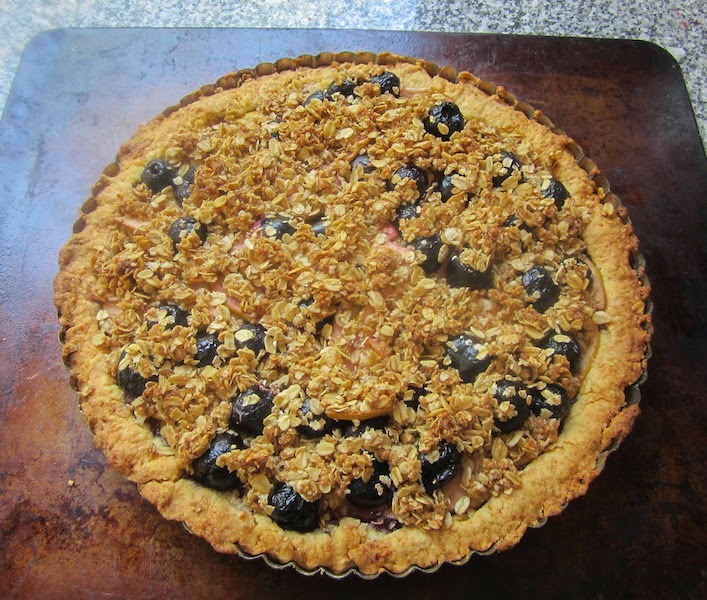 Sweet juicy cherries tossed with tart green apples then topped with a brown sugar oatmeal crumble and baked in a slightly sweet crust, this may well be the perfect tart. This post is a little walk down memory lane for me. Two and a half years ago, we were living in Cairo, Egypt. Vegetables and fruit are grown all along the verdant Nile valley, an area so abundantly fertile that it makes a dramatic satellite photo. With such a proliferation of fresh produce, hardly anything is shipped in so eating seasonally is just about the only choice. And the honest truth is that the majority of Egyptians could not afford expensive imported goods. Isn’t that extraordinary? Lush vegetation thrives all along the river valley, in the middle of starkly barren desert. According to the Encyclopedia Britannica, arable land makes up only three percent of Egypt's land mass. Here in Dubai, we have the same issue but no Nile. There are some lovely vegetables grown in farms in the desert but they require substantial irrigation from expensively produced water and have growing months limited by the scorching temperatures of summer. Fruit trees that require cold weather to blossom are out of the question. Which brings me to cherries, which are our ingredient of the month for my Foodie Extravaganza group. All the fresh cherries in Dubai are imported and terribly expensive so I was debating what I could make or bake with canned or dried ones. 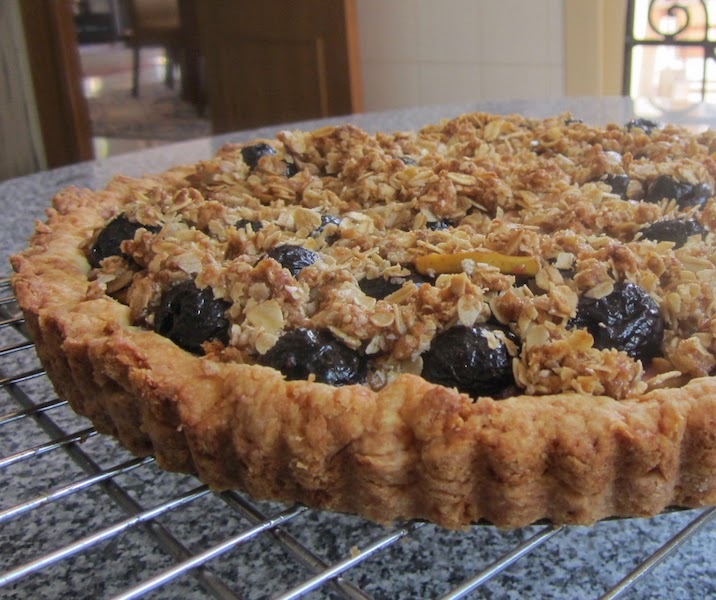 Then I remembered this lovely cherry and apple crumble tart that I baked and photographed while we lived in Cairo but had never shared. The sweet deep purple cherries add such a lovely flavor to the crisp apples. In case you are curious, visit Egypt in August or September to enjoy the abundant cherry crop. The recipe for the crust was shared with me almost 20 years ago by my friend, Mary, who lives in the Channel Islands. 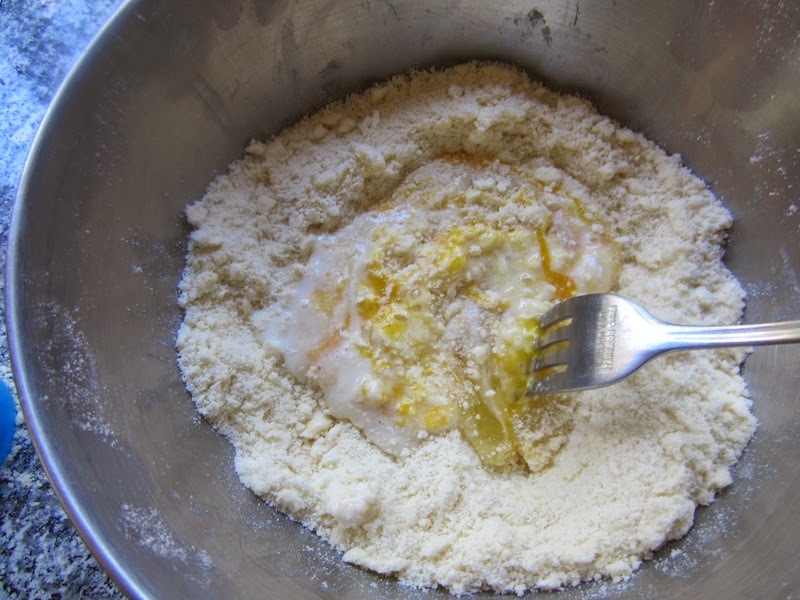 In a large mixing bowl, sift your flour, sugar, baking powder and salt together. Cut the butter into pieces and add them to the dry ingredients. 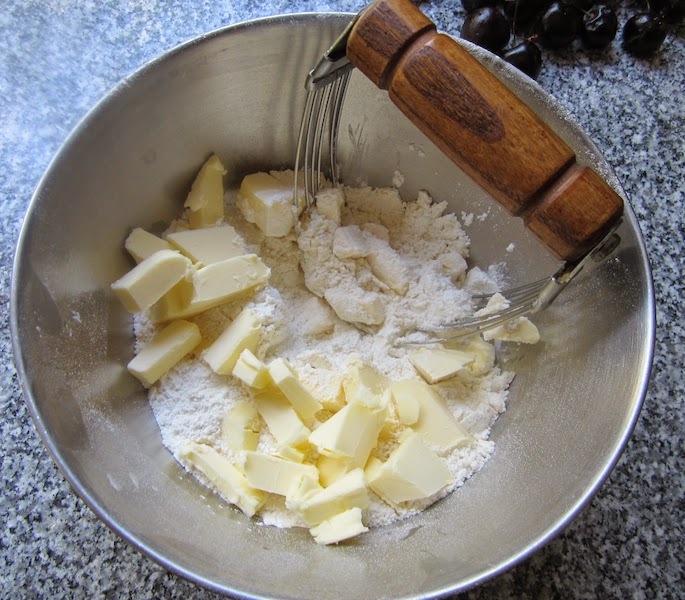 Use a pastry blender to cut the butter into the flour, until you end up with a rather sandy texture. Make a well in the center and add the egg, vanilla and one tablespoon of milk. Mix them into the flour with a fork. Add more milk if it seems too dry to come together as a dough. Knead quickly with your hands for just a few turns. 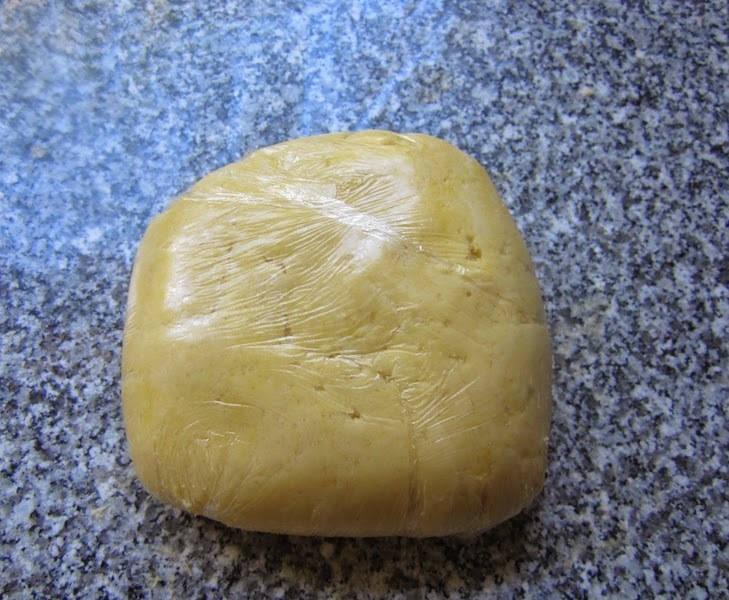 Wrap the dough in cling film and chill for 10-15 minutes in the refrigerator. Meanwhile preheat your oven to 350°F or 180°C. While the chilling and the preheating are going on, let’s start preparing our filling. Pit the cherries with a cherry pitter or, failing that, three or four toothpicks taped together can be pushed through one end of the cherries to dislodge the pits. 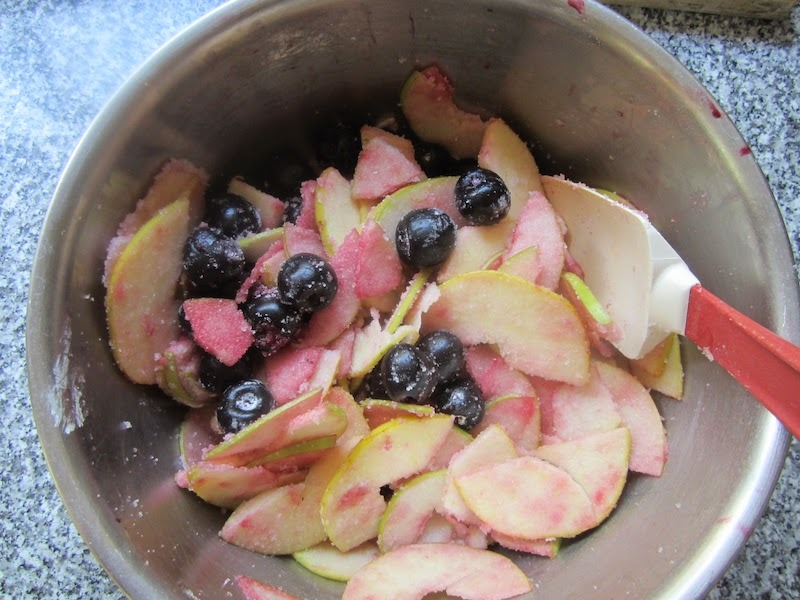 Put the cherries in a bowl that will be big enough to hold your apples, once sliced, as well. When chilling time is up, roll the dough out and fit it into your tart pan. Mine is shallow and wide, about 11 in or 28cm across. Prick it all over with a fork or the tip of a sharp knife to help keep it from puffing up while baking. 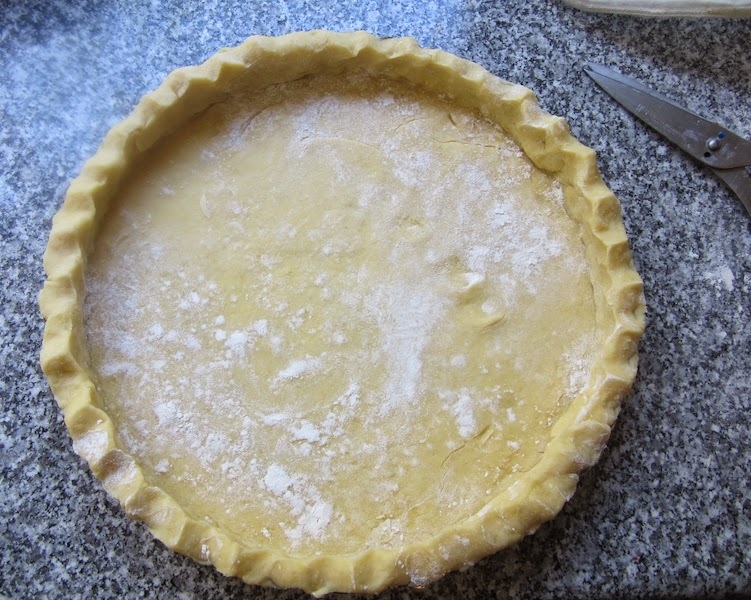 Line the inside of the crust with baking parchment and fill it with pie beads or dried beans. Bake it in your preheated oven for 10 minutes. While the crust blind bakes, prepare your apples. 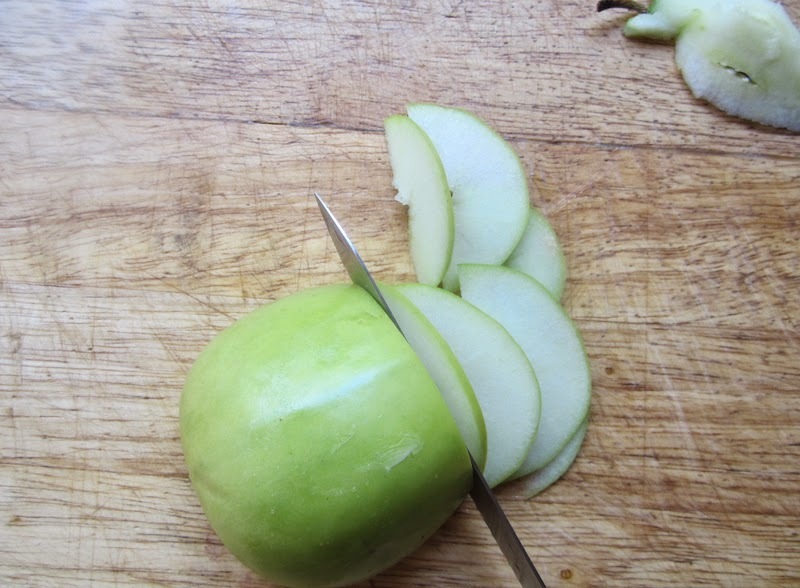 Cut them in half and remove the cores. If you can manage to slice them very, very finely, you can leave the peelings on, otherwise, it’s probably best to peel. Slice them as thinly as you can and pile them into the bowl with the cherries. Add in the sugar, cornstarch and salt for the filling and stir well. 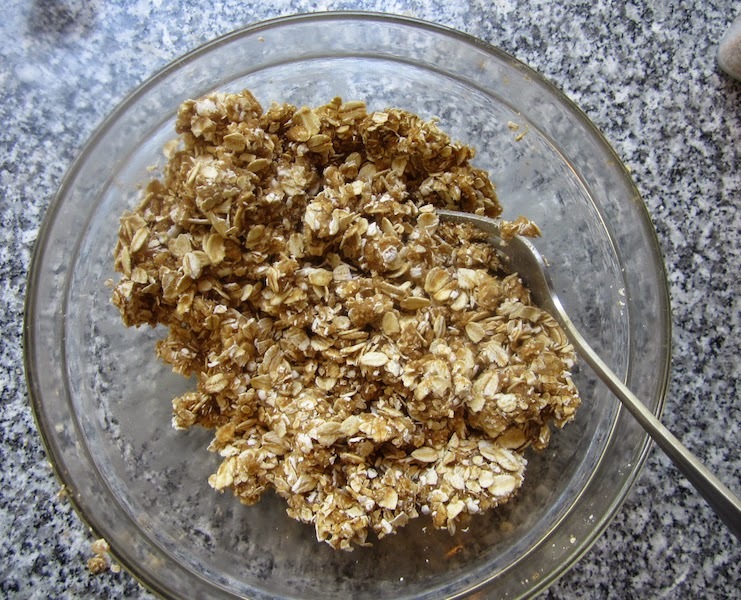 In another bowl, mix together your crumble ingredients. Once the crust has finished baking, take it out of the oven and allow to cool for a few minutes before carefully removing the parchment and pie beads or dried beans. Pile the cherries and apples in the crust and spread them out somewhat evenly. Sprinkle on the crumble to cover. Bake for 45-50 minutes or until the whole tart is golden and the apples are cooked through. I completely forgot to take a photo of the tart being served but I can guarantee each slice was accompanied by a healthy pour of thick cream. Because that’s how tarts must be served, according to my husband. If you want to add a scoop of vanilla ice cream instead, feel free. If this is your first time joining us, the Foodie Extravaganza is a monthly party hosted by bloggers who love food! Each month we incorporate one main ingredient into recipes to share with you and this month that ingredient is a Valentine's Day classic, cherries! Be sure to check out the rest of these fantastic cherry recipes!